In the horticultural sector, diffused light is increasingly used by means of a diffuse coating. This coating scatters the light into the crop and ensures that a crop is not damaged due to too much light. At the same time, there is no loss of light when using a diffuse coating. Eventually this together causes less stress for the crop, a lower wax temperature in the upper leaf layers and a higher leaf temperature in the lower leaf layers. Diffuse coating have been given an established place within the category of screen materials in addition to the shading agents. Coatings offer the solution for crops that are not resistant for high temperatures, but that do have a great need for growing light. With a diffuse coating, a greenhouse can be easily coated in the summer with a layer that allows growth light to pass through, but at the same time also reduces the heat. Coatings ultimately result in higher production and higher quality of the crop. For a maximum effect of diffuse coatings, you are dependent on the amount of radiation and the number of hours of sunshine in a summer period. A crop that feels good will perform better. Due to the better greenhouse climate, the crop is no longer at the 'survival position' in the moment of high sunlight and higher temperatures (i.e. there is no continuous stress on the plant). The plant remains comfortable, photosynthesis is maintained, and growth is maintained. 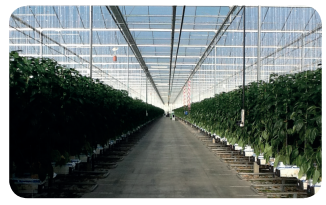 This new greenhouse climate environment also requires a new approach to CO2 dosing, a modified fertilizer strategy, modification of interior screens and ventilation. If these growth parameters are also well controlled, the benefits of diffuse coatings will be even greater. When in summer the radiation increases, and a higher protection of the crop is required, then a chalk layer can be applied over the diffuse coating. A shading agent then reflects the excess sunlight that is created, so that the crop can grow even in the warmest period in an ideal light and temperature environment. Always get advice on how to combine diffuse coatings and chalk fluids. Do you have questions about the use of a diffuse coating, or about the effect of diffused light? Then, contact product specialist Richard Hagedoorn, or ask your question using the form below. We'll respond within 24 hours on working days. - What is the difference between diffused glass and a diffuse coating?